Ws – YO, insert hook into designated stitch, YO and draw yarn through stitch and through one loop on your hook. YO and pull through both loops on the hook (first half of Ws completed); YO, insert hook in same stitch, YO and draw yarn through stitch and through both loops on your hook (second half of WS completed). Sc2tog – Insert hook into designated stitch, YO and pull up a loop. Insert hook into next stitch, YO and pull up a loop. YO and pull through all loops on your hook. One decrease made. This tutorial is also available in a left-handed version. Click here to be directed to the left-handed tutorial. Row 41: Ch. 1. Sc into each stitch. Row 42: Ch. 1. Sc2Tog in the first 2 stitches. Sc in remaining 10 stitches. Row 43: Ch. 1. Sc2Tog in the first 2 stitches. Sc in remaining 9 stitches. Row 44: Ch. 1. Sc2Tog in the first 2 stitches. Sc in remaining 8 stitches. Row 45: Ch. 1. Sc2Tog in the first 2 stitches. Sc in remaining 7 stitches. Row 46: Ch. 1. Sc2Tog in the first 2 stitches. Sc in remaining 6 stitches. Row 47: Ch. 1. Sc2Tog in the first 2 stitches. Sc in remaining 5 stitches. Row 48: Ch. 1. Sc2Tog in the first 2 stitches. Sc in remaining 4 stitches. Row 49: Ch. 5. Turn your work and join with a Slst at the last stitch to create the button hole. Bind off and weave in your ends. Sew button to the end of the headband opposite of the chain 5 button hole. I think I see the issue with the sizing. Above, it states that the yarn used is “medium roving”, but in fact it is not a medium/4 weight yarn. This is a bulky/5 weight yarn, so your typical worsted will not work to get the sizing you want. You need to use the exact yarn noted on material list or another bulky/5 weight yarn. I hope this helps! Hi Brittany, is there a gauge for this pattern? Did I miss it somewhere? I had to add more rows. So now I’m wondering if my width is correct since I had to add more length. I’m giving this away and my head is smaller than most, so I can’t go by my measurements. Thank you. Hi Raylene! I’m working through edits on this pattern. It seems that a lot of people are struggling with the sizing so I am making another one and going through each step to find any errors (if any). In my latest version, I’ll have the gauge info. What yarn are you using for yours? Any updates on when the gauge will be posted? Made this headband. Love, love, loved it! Had to add extra rows bc it was for an adult. I also made hand warmers to match. The set is too cute. Thanks for sharing. How can I modify this to fit a Toddler? Hi can we sell to family and friends? Would hope she corrects pattern or video, because the definitely don’t match up. Hello. I was wondering if you knew that the written pattern does not match the video. Might want to update the written portion. I haven’t had any previous complaints about this. Is it still occurring? If so, what browser are you using? Sometimes viewing through a mobile device may cause problems with the page resizing. 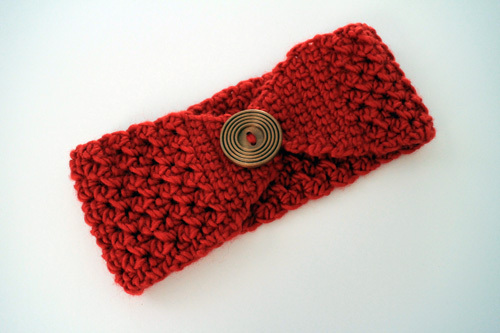 Brittany, I made the Buttoned Up Headband for my daughter who is in college and she loved it! I receive your emails and have a file in my computer for all of them except for this one. I tried to share this to my email address 3 times and each time I did I got a message that it had completed and emailed but I’m not receiving the email on my end. Could you please email to me the Buttoned Up Headband pattern and tutorial so that I may save it in my email file? Maybe if you email it to me I’ll get it. I would appreciate, thank you. The red yarn was a mill end find at Joann’s. It’s a medium weight roving style yarn. If you’re unfamiliar with mill end bags, they are 1 lb bags of yarny goodness for $7… only problem is you don’t know what kind of yarn it is. Vickie Howell Sheepish would be a great yarn choice for this headband and it’s very easy to come by! Tried your headband stitch day before yesterday and two headbands later I am now using it to make a pair of bedsocks – lovely and warm stitch. Thanks for the video tutorial, I would never have mastered it without the tutorial! That’s great! Wow, I never thought to make socks with the woven stitch. I bet it is perfect! Lovely pattern. I have made two with different types of worsted weight yarn, but both look barely big enough for an infant. From row one to row 49, it is 13 inches. Does this sound correct? I am going to try a bigger hook next. Instructions are great, very easy and the video tutorial was well done. That definitely sounds incorrect! Are you using a size 5mm hook? Mine measure around 28″ when it’s buttoned up and fits my head which is around 22″ circumference. Thank you for another beautiful pattern. I really enjoy your videos. You have a very pleasant voice that soothes the nerves of one learning a new stitch.